I am frequently struck by carefully, elegantly, curated interiors, I could stare all day at the photos of Yves St Laurent’s and Pierre Bergé’s place. I am amazed that it was kept together so long. Especially since a fashion designer is subject to the shifting winds of fashion and the continual need to reinvent. Do you tend to stay with a decor once you’ve put it all together? Or do you subscribe to the theory that for all things there is a season? Not having a summer residence to which we can retreat, Mrs. E. and I live surrounded by our things for 12 months a year. Sometimes we add a painting and as a consequence move another, but for the most part, not much changes. Lately, Mrs. E. has made an investment in art. For my birthday, she trolled eBay, researched an artist and came up with these wonderful paintings now hanging on our dining room wall. The artist’s name is George Pearse Ennis (1884 – 1936), and he was already an established presence in the art world by the 1910’s. He had a long history with West Point and eventually created stained glass windows for the chapel there as well as murals and windows for for the Unitarian Church, Eastport, Maine; the Presbyterian Church, Cornwall, New York; the Calvary Methodist Church, Bronx, New York, and the First Baptist Church, Jamaica, Long Island, New York. He was an accomplished watercolourist and wrote the entry on watercolours for the Encyclopaedia Britannica. He died in an automobile accident in 1936. 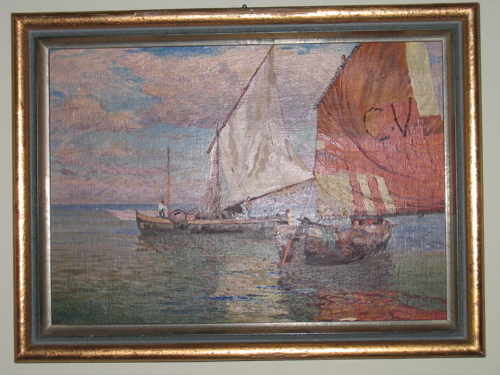 If our finds are the real McCoy, we have two very nice oils by Mr. Ennis. But frankly, we paid about what we would have for oils by local, contemporary artists and I find the paintings and subject matter very appealing. Using my criteria, they were a deal! Hanging them where we did forced us to move two other paintings that had previously occupied that space. But really, that’s about the only change to the manse in the last six months or so. I’m curious, are you a set it in place and live with it forever sort? Or do you change with the seasons? (I’d love to do the whole white canvas slipcover thing at least one summer.) Is the secret to an elegant living space ruthless curating, constant renewal and eternal vigilance against clutter? Or is it the accumulation of a lifetime’s worth of curios from your own Grand Tour of Life? This entry was posted in Living and tagged George Pearse Ennis, Pierre Bergé, Yves St. Laurent. Bookmark the permalink. I move pictures with some frequency, but furniture stays. Lovely pictures. I’ve never heard of the artist, George Pearse Ennis before. So, I learn something new today. I saw the auction of Yves St Laurent’s collection of art and interior decor. It’s absolute to die for. His taste was impeccable and colourful. BTW, I saw your last post about your breakfast. It definitely made me hungry! We are of the school of thought that the decor represents an accumulation of our lifetime adventures. Larger items, including artwork, sculptures, furniture remain for the long haul; however, they may move to different areas when more is accumulated. 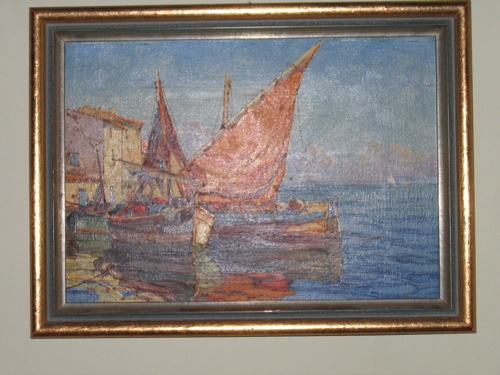 As an example, my grandfather was a artist since the 1920’s through his death in 1992. His paintings are always in the house, but will move to different spots as need be. One will ALWAYS, though, maintain the coveted spot above the fireplace mantel. I accumulate and my Dear Lovely Wife ™ curates. The last furniture movement occurred when DLW acquired a piano. Yesterday evening we picked up a print by a local folk artist and that set off a round of musical art work. Seasonally, the nick-nacks change and DLW will decide the art needs to move around but the furniture stays put. I suppose that is one of the advantages of living in a “right sized” house. I have a preschooler and an infant. All of our furniture is being turned into junk by them. When they’re older, we’ll worry about nice furnishings. The wall decor is nicer now than when I was a bachelor, but is, shall we say, a work in progress. In the process of editing and in a way curating right now. I gathered some drawings and paintings on to one wall in a group and having lived with the idea for a couple of weeks really rather like it. It will be an changing display, probably, and to that end all the pictures are on velcro not hooks. Welcome Blue! Velcro? How interesting and what a good idea. 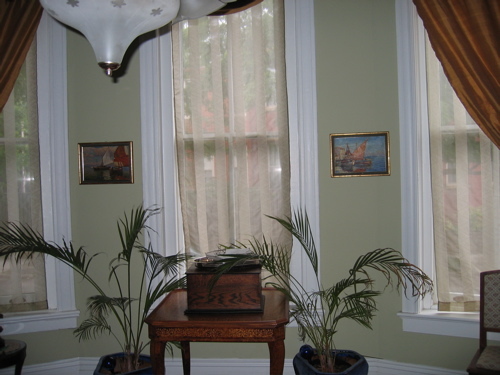 I have plaster walls and it can be a nightmare hanging pictures. Mrs. E. and I once lived in two rooms in a house that was being torn down around us. We had all of our art on one wall — floor to ceiling. It was my favourite wall for a very long time. nail holes in plaster walls do not enter into the decision. Having said that, and having admired your latest acquisitions, I would isolating them as they are seen now, they look sadly puny and lost. Group them, team them up one over the other (obviously on another wall that allows such a format) and then they’ll really amount to something special. Hello Mr. Worthington, that would be ideal. At the moment they are part of a continuum of paintings all hung at the same level circling the room. I’m hoping to add a few more, stacking them between the windows. I like those brass picture rods for exactly the reason you state, no holes (or cracks) in the plaster. Beautiful paintings! I really love Toby’s idea about the rod and chains. And I agree with Toby about how he said to hang them. I think hung together would be twice the impact. Enjoy them – they are wonderful!!! I love to move my painting around with the seasons, on a whim, etc. It can create an entirely new look! Meant paintings and collection of botanical s.
I just recently moved some art around with the acquisition of a pair of asian-inspired 60’s mirrors. My favorite portrait (photograph) of my grandmother moved from it’s longtime place on the “mantel” (actually it’s a sideboard, but it is high and does the job of a mantel, particularly at the holidays) to another wall. Her frame was just too large and covered the mirrors too much. (The portrait sat on a tabletop easel on the sideboard — in front of where the mirrors now are.) Now a print that is a bit smaller lives in front of the mirrors. I find it gives some good depth the the room. I do agree with those that would like to see the two new paintings together – stacked. They tell more of a story together, a beautiful evocation of a seaside moment. And I can imagine the walls a warm, sunset kind of color that would relate more to the paintings. Whatever the arrangement, the Mrs. has fabulous taste. Hopefully they will grow in worth for you and your nest-egg. The water is so dreamy in the paintings, just eery how the artist got the right fluidity and mirror quality. Love the paintings.. been doing some research on George.. He was married to my Gr. gr. Aunt Georgia Leaycraft Ennis also an artist, before he married Galdys Atwood Ennis.. Just had to comment on how beautiful the paintings look on the wall.. Enjoy your wonderful art!! Renee in Orlando, Fl. Hello Ms. Friedel, Really?! Truly a small world. We are truly enjoying them. I was gazing at the boats just yesterday at luncheon and daydreaming about a Grand Tour.